Take off the existing cap on the car. Separate the cap and install first only the black adapter (1) on the vehicule and block it. Put the screws (3) then fix alternating and block them, but not too hard. Practise the introduction procedure, at the petrol station, with a diesel gun that must be fully inserted into the cap. If it is not the case or petrol come outside, you are not correctly alligned and you need to go back to step 4. At the end of each filling, please remove the gun and incline it in order to avoid that the petrol dripping on the body of the car. Guide the cap in a different manner. Turn the yellow part a quarter turn (fixed by four screws) in one direction or in another should the problem persist. 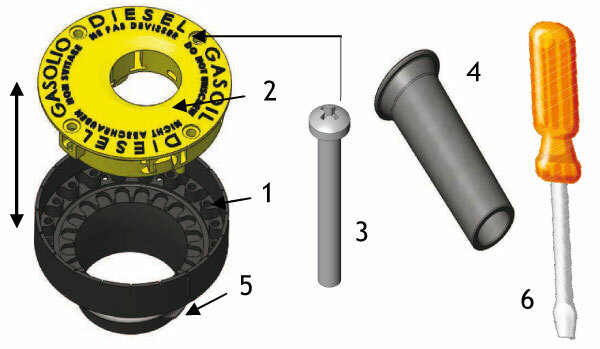 The diesel nozzle penetration hole is often positioned underneath or if not, it must match with the gun hole and your car tank. The distributor declines all responsibilty in case of any problems arising if the procedures are not followed correctly. Guarentee of product for one year.